THE "Wood Pigeon" light biplane designed and built by the Westland Aircraft Works of Yeovil for the Lympne competitions is in outward appearance a normal single-bay ДальшеMore>>> tractor biplane, but when one comes to look into the detail construction many novel and interesting features are to be found, notably in the system evolved for folding the wings, which is different from any we have seen so far. 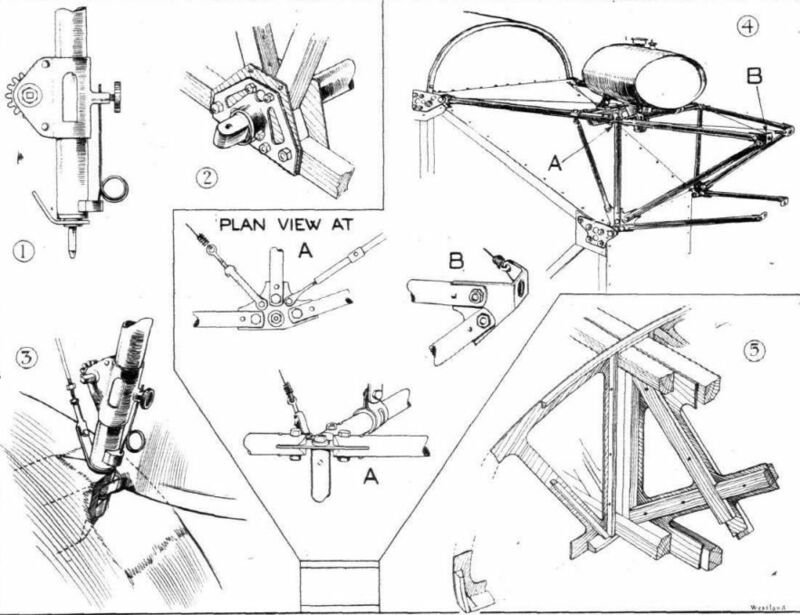 In addition the biplane wings are provided with wing flap gear which can be used either as a perfectly automatic device or as a mechanically operated variable camber gear - i.e., the movement of the flaps is automatic in normal flying, but should the pilot, for some reason or other, desire to give greater camber than is automatically provided, he can do so by mechanical hand-operated means. At the moment it is not permissible to describe this device in detail, nor to publish sketches of the mechanism, but the general principle is as outlined above. 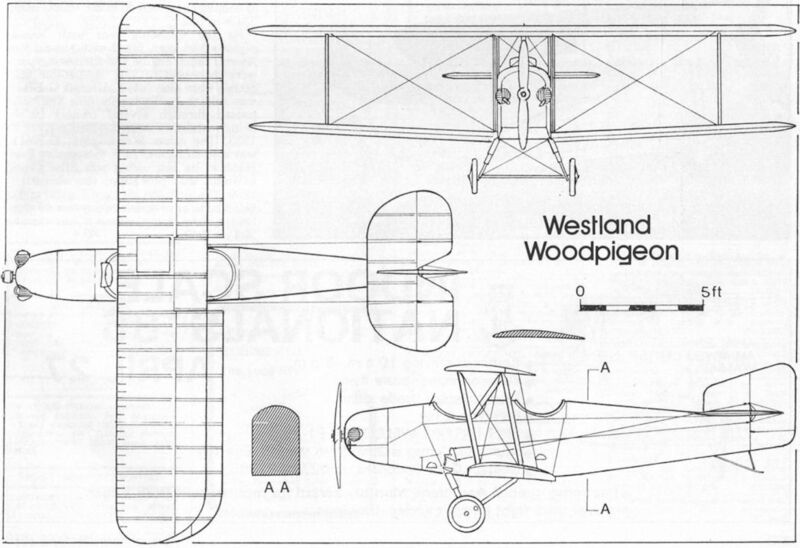 The Westland "Wood Pigeon" is, then, a normal single-bay tractor biplane, with the lower plane set at a dihedral angle, while the top plane is straight. The fuselage is rather unusually deep at the stern post, in order, probably, to make the trailing wing flaps clear the ground when the wings are folded. Otherwise there is nothing remarkable about the external appearance of the machine. The fuselage is of the usual type, with wire bracing in the rear portion, but triangulated construction in front. 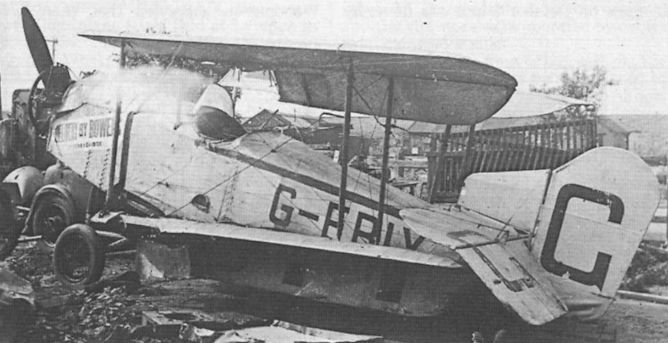 The two cockpits are arranged in tandem, and access to both is facilitated partly by the special strutting employed, resulting from the unusual folding arrangement, and partly by having the trailing edge of the inner portion of the top plane (there is no top centre-section, strictly speaking) hinged to fold upwards. The controls are of the orthodox "joy-stick" type, but the elevator is operated by cables from external cranks, as shown in the general arrangement drawings. The camber gear, as already stated, may not be described in detail. 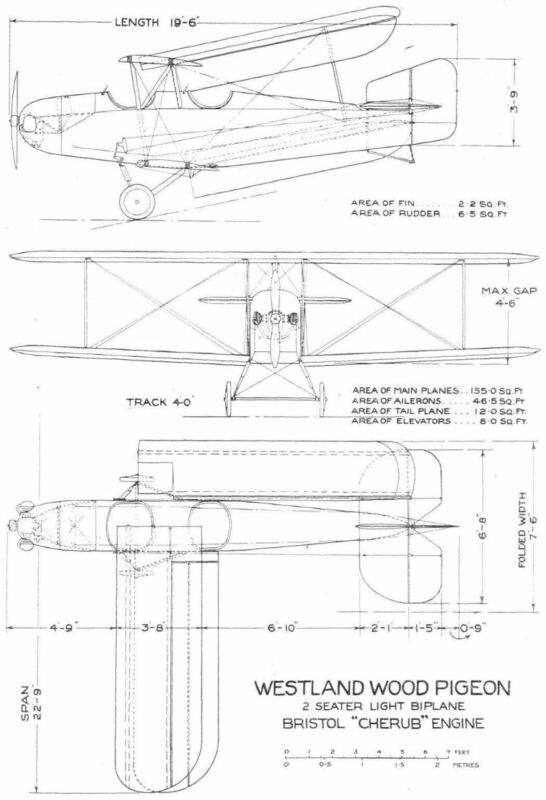 The biplane wings are of normal construction as regards their spars and ribs, but a very unusual attachment to the fuselage is provided. The front spars meet on or rather above the centre line of the fuselage. The rear spars, however, stop short, and are hinged to the equivalent of a top centre-section rear spar, carried on inverted vee struts from the top longerons. These two inverted vees, of steel tubing, are braced laterally by wires across the top of the fuselage. The two front spars, meeting in the centre, are not supported direct from the fuselage, their inner ends being overhung. In place of the usual front struts rising from the top longerons, and supporting the top centre-section front spar, longer struts, running down just outside the fuselage, meet the lower front spar. These struts are, in fact, fitted in the position usually occupied by the "jury struts" used when the wings of a biplane are folded, only in the Westland "Wood Pigeon" they are permanent members of the structure. For folding the wings the trailing edge of the inner end of the top plane is raised, the pin locking the two halves of the front spar together is withdrawn, and the plunger in the lower end of the front struts is raised sufficiently to clear the fitting on the fuselage, when the wings can be folded back. The inner front struts are provided with a special plunger, as shown in Figs. 1, 2 and 3, built into the end of the struts. There are three positions for this plunger. In the first it is right down and engages with the fitting on the fuselage, locking the wing in place in the spread position. 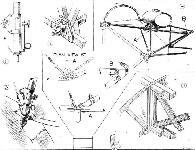 In the second it is withdrawn sufficiently to allow of the wing being folded, while in the third, or topmost, position, it is withdrawn into the strut end sufficiently for the strut to be removed from the wing. The upper end of this strut is a plain forked end attached to an eyebolt. Two types of undercarriage have been developed for the two Westland machines. 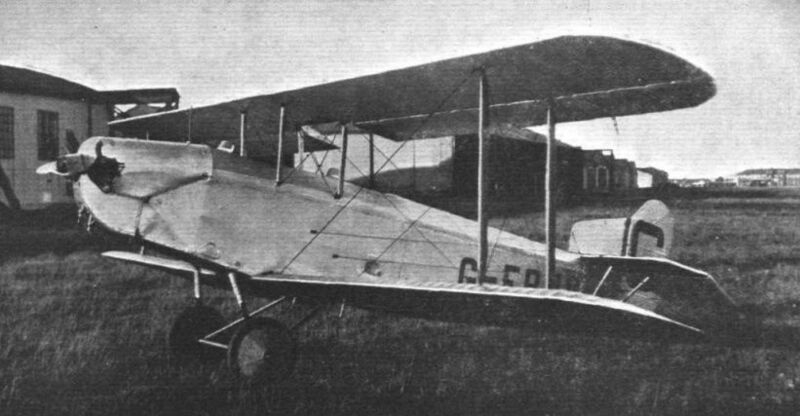 One is of the oleo-pneumatic type, and is shown in the photograph of the biplane. The other has friction devices incorporated in the telescopic legs. At the moment we are not quite certain which type will be fitted in the competitions. The Bristol "Cherub" engine is mounted on a steel tube structure, details of which are shown in Fig. 4. The tubes are slotted to receive the plates, etc., and are reinforced at the ends by aluminium filler blocks. 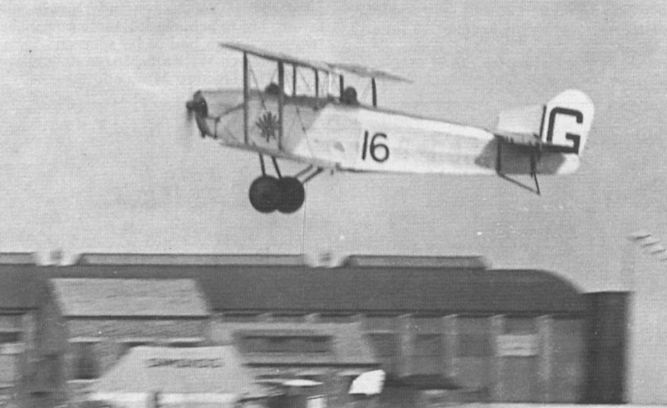 As far as we have been able to ascertain, the Westland "Woodpigeon," which has now been acquired by the Seven Aeroplane Club and entered by it for the Lympne meeting, is identical except for its engine with the machine which was designed and built by the Westland Aircraft Works, of Yeovil, for the 1924 competition. Running-up the engine of No. 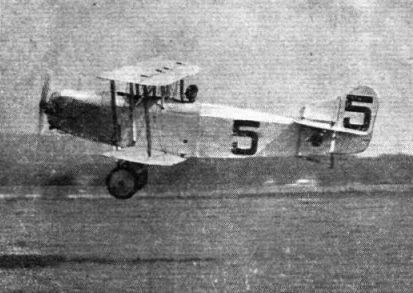 5, the Westland "Wood Pigeon." No.16. THE WESTLAND "WOODPIGEON": This machine has been entered by the Seven Aeroplane Club. No. 5, THE WESTLAND "WOOD PIGEON": Three-quarter rear view. 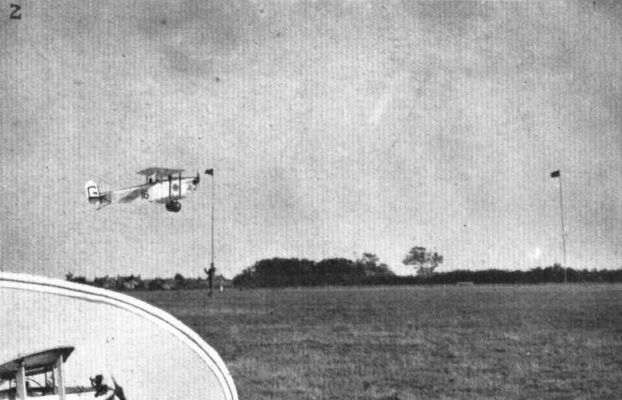 LOW-SPEED FLYING AT LYMPNE: 4, Gaskell on the Westland "Wood Pigeon"
ELIMINATING TRIALS AT LYMPNE: 2, the Westland "Woodpigeon" during a take-off attempt. 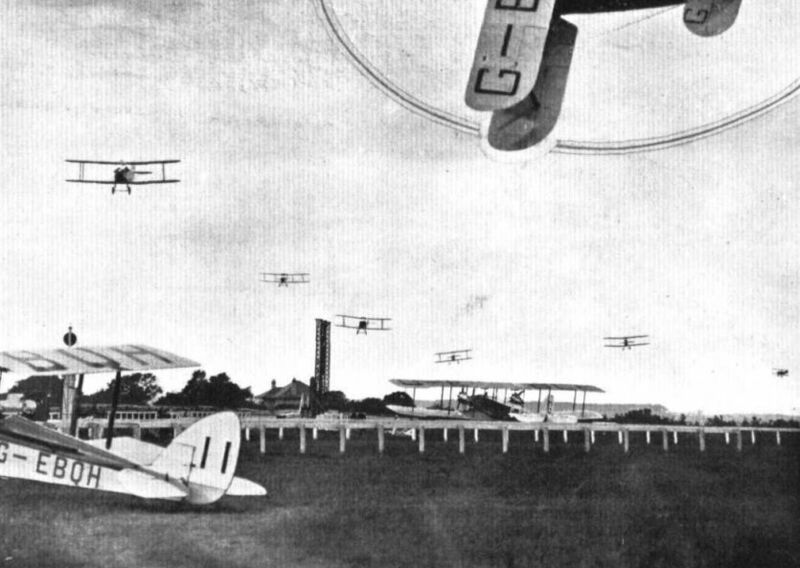 THE PRIVATE OWNERS' HANDICAP: The machines are here seen approaching the aerodrome turning point at the conclusion of the second lap. Mr. Norman Jones was so far ahead as to be out of the picture. The others are, in the order given - Longton, on the "Bluebird," de Havilland on "Moth" NO, Col. Sempill on D.H. 51, Hinkler on his "Avian," Lady Bailey on her "Moth," PU, and Scroggs on the Westland "Woodpigeon." 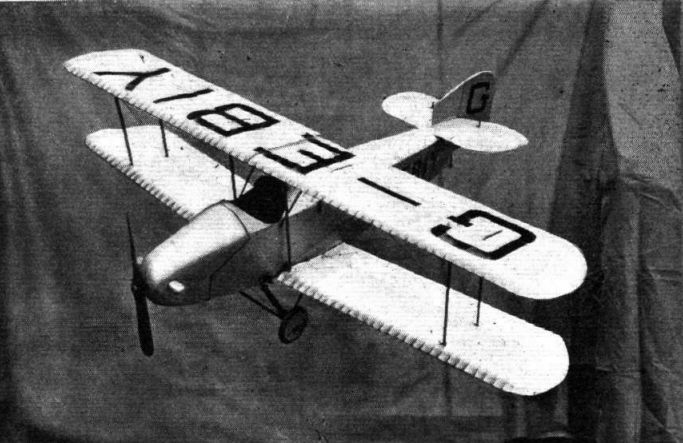 Scale model of the Westland "Wood Pigeon" light biplane. SOME MORE CONSTRUCTIONAL DETAILS FROM LYMPNE: (8) External elevator cranks on Westland "Wood Pigeon." Sketch also shows front chassis strut attachment. SOME WESTLAND CONSTRUCTIONAL DETAILS: 1. 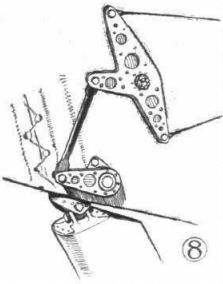 Shows the rack and pinion by which the locking pin in the lower end of the front inter-plane strut is brought into engagement with the lug on the fuselage. The pin is withdrawn from the fuselage lug by a turn of the pinion, using a special spanner, and the wing can then be folded. A further turn brings the pin right out of the spar fitting, and the strut can then be removed from the wing. 2 shows the fuselage fitting, and 3 the strut in position with wing spread. 4. Gives details of the tubular engine mounting and its attachment to fuselage. 5. Details are given of the wing construction of the Westland monoplane two-seater. The spars consist of a central three-ply web, with divided flanges and lattice bracing, all of wood.